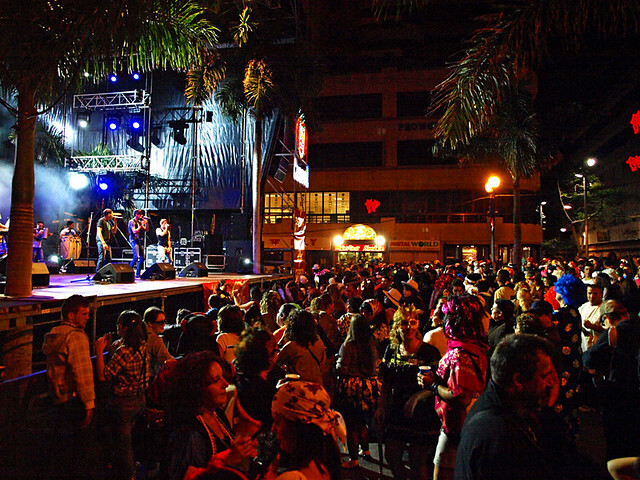 HomeTenerifeFiestasWhich Tenerife Carnival is Best, Santa Cruz or Puerto de la Cruz? 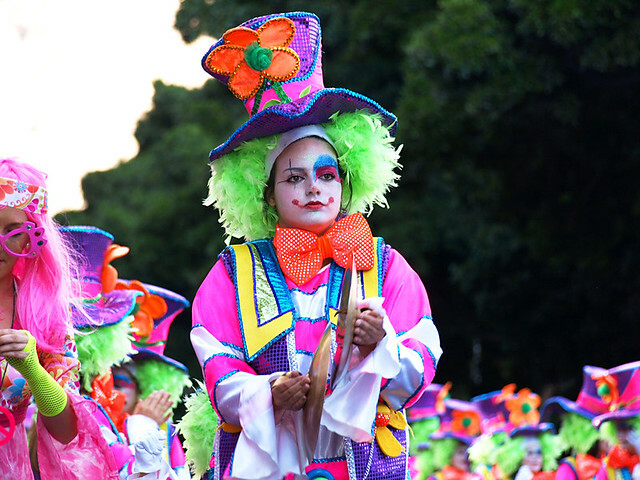 Which Tenerife Carnival is Best, Santa Cruz or Puerto de la Cruz? 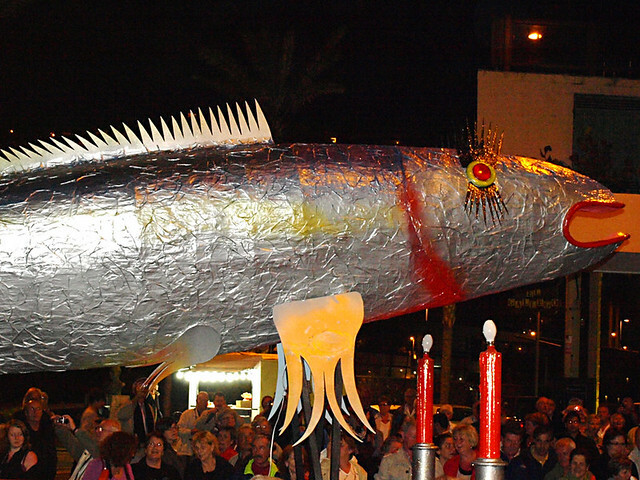 There are actually quite a few carnivals on Tenerife. 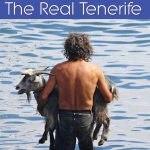 Many towns hold their own version and even resorts like Los Cristianos and Los Gigantes have parades and small street parties after the big carnival drums in the north of Tenerife have stopped beating. For visitors who want the full on carnival experience – to get dressed up, get down and get slightly drunk with the locals or even just to experience the best parades – the two best options are carnival in Santa Cruz or carnival in Puerto de la Cruz. The big question is – which carnival is best? There’s no question that Santa Cruz carnival is way, way bigger than the one in Puerto de la Cruz. The parades involve more people and there are bigger crowds at the street parties, Santa Cruz gets 100,00 revellers to Puerto’s 35,000 which is still an awful lot of people, especially when you’re standing in the middle of them. The upshot is that both are big and boisterous affairs. In terms of length the main events in both locations take place over the course of just over a week (between 9 and 18 February in 2018). When it comes to size, Santa Cruz wins. 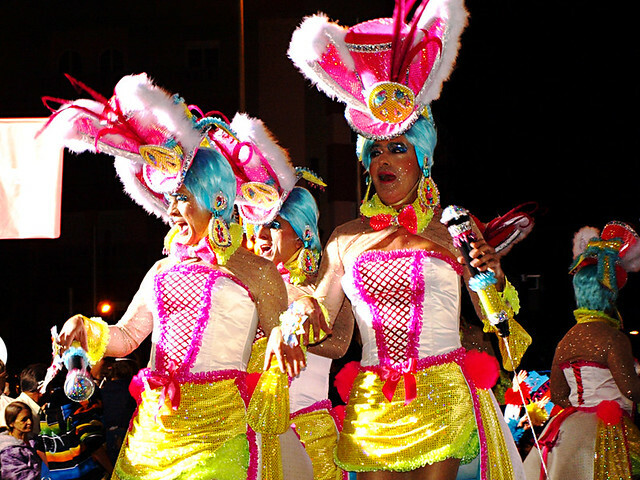 In both Santa Cruz and Puerto de la Cruz the gala to elect the carnival queen lasts most of the night and into the early hours. 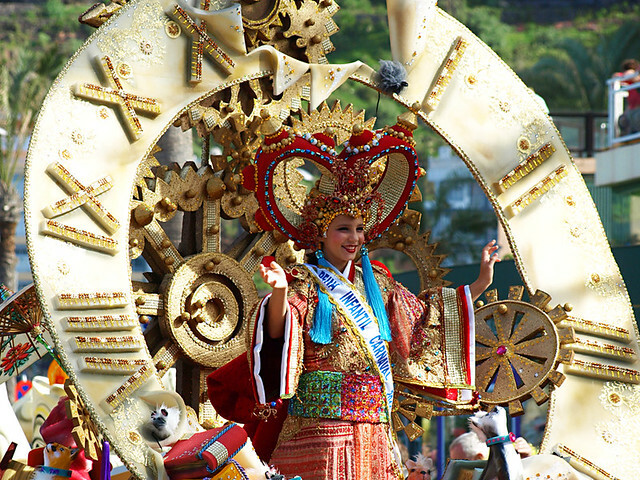 These galas tend to attract locals more than visitors and are like an old fashioned variety show with dancers, singers and the parade of the queens in their fantastical chariot costumes. Both are flamboyant affairs but in the end it comes down to scale. 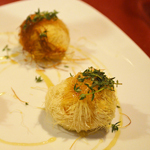 Santa Cruz attracts some big names in the Spanish music scene and the likes of Gerard Depardieu and Sophia Loren have been judges whereas Puerto de la Cruz tends to attract local celebrities and minor names from Spanish TV. Both are enjoyable, if epic, affairs. We endured 7 hours of the election process in Santa Cruz. In recent years Puerto de la Cruz can’t seem to make up its mind whether its having an opening parade or not, resulting in some quite poor shows. In Santa Cruz there’s a real sense of the start of carnival and there’s a buzz throughout the city. Those in the parade are carnival fresh (this is important as you’ll see later) and full of enthusiasm. It’s a lively affair and really gets those carnival juices flowing. No contest, the cabalgata in Santa Cruz is carefree, wild and lots of fun. In both locations you’re going to get a giant sardine in make up, wailing drag widows flashing plastic penises and false breasts, a parade and a funeral pyre followed by a fireworks display. The one in Puerto de la Cruz starts where many of the hotels are located and ends at the harbour beach. It’s a nicer setting and more accessible for visitors. Puerto wins by a pair of fish lips on this one. The most outrageous race you’re likely to witness. Priscilla, Queen of the Desert in a street race. But the High Heels Marathon isn’t about the race it’s about over the top witty costumes and playing to a crowd that loves to lap up the theatrics. It’s raining men… in women’s clothing. In recent years it’s become the carnival event to see. 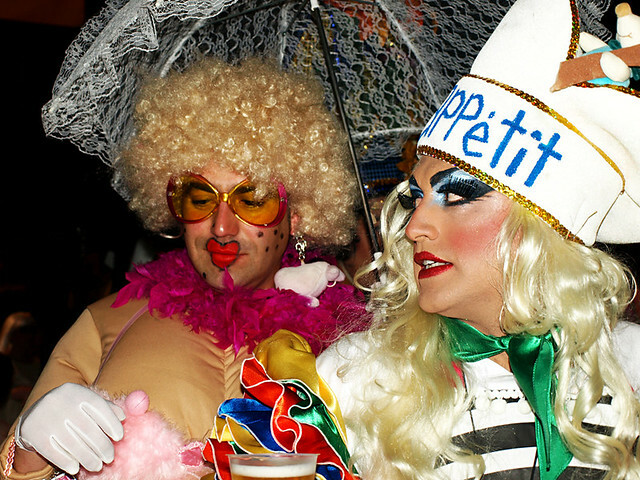 The High Heels Drag Marathon only takes place in Puerto de la Cruz making it the winner by default. The Coso Apoteosis in Santa Cruz attracts more visitors and ex-pats from the south of Tenerife than any other carnival event. It’s bigger than the one in Puerto de la Cruz with more comparsa dance groups and bands, but it’s not better. The reason for this is all to do with sticking to tradition and a carnival fact that a lot of non-Canarios don’t know. One of the liveliest and most popular nights where the carnival street parties are concerned is the Monday night of carnival week. By sticking with tradition Santa Cruz holds it’s closing parade on the Tuesday of carnival week, the day after the crazy night before. Many of the people in the parade, especially the younger ones, just don’t want to be there. They look knackered and lack energy and enthusiasm. For carnival first timers it might look like a colourful extravaganza but when you’ve experienced the fun of the opening parade, it’s a damp squib. It’s been coined ‘the tourist parade’ by some locals. Puerto de la Cruz, on the other hand, holds their closing parade on the last day of carnival and it’s followed by the last street party. Subsequently everyone is fired up for the final carnival party before it’s all over for another year and this means the atmosphere in Puerto blows that of the lacklustre but visually impressive parade in Santa Cruz away. These are the heart and soul of carnival. The elections and parades are an experience but are ultimately a bit of theatre. The true spirit of carnival belongs with the people and the fun they have in the streets. These parties takes place most, but not all, nights (even the most ardent carnival fan needs to rest sometime). Santa Cruz has a funfair, lots of live music, DJ stages and food stalls but they are spread out over a big area. 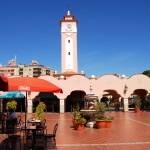 In Puerto de la Cruz, the parties takes place in the streets around the harbour area with live bands in Plaza Charco and DJs beside Casa Aduana and at the entrance to the harbour where there are also cerveza stalls and food kiosks. In both locations it’s essential to dress up; in both the party doesn’t really get going till after midnight and lasts all night and in both places you will have bags of carnival fun. Personally I like the more compact feel of the ones in Puerto de la Cruz, I think it gives the parties a better atmosphere. But it’s a close call. So which is best.? The fair answer is that it would be unfair to chose between them. 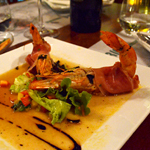 Both offer a totally unforgettable carnival experience and an awful lot of partying. Carnival party animals will not be disappointed by either. Because they are on different dates I suppose it would be possible to get the best of both worlds by going to the first few events at Santa Cruz and then the remaining ones at Puerto! 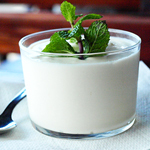 Thanks for the great info – sounds like a plan for us for next year! Last year we did most of the Santa Cruz events. this year we stay on home ground.